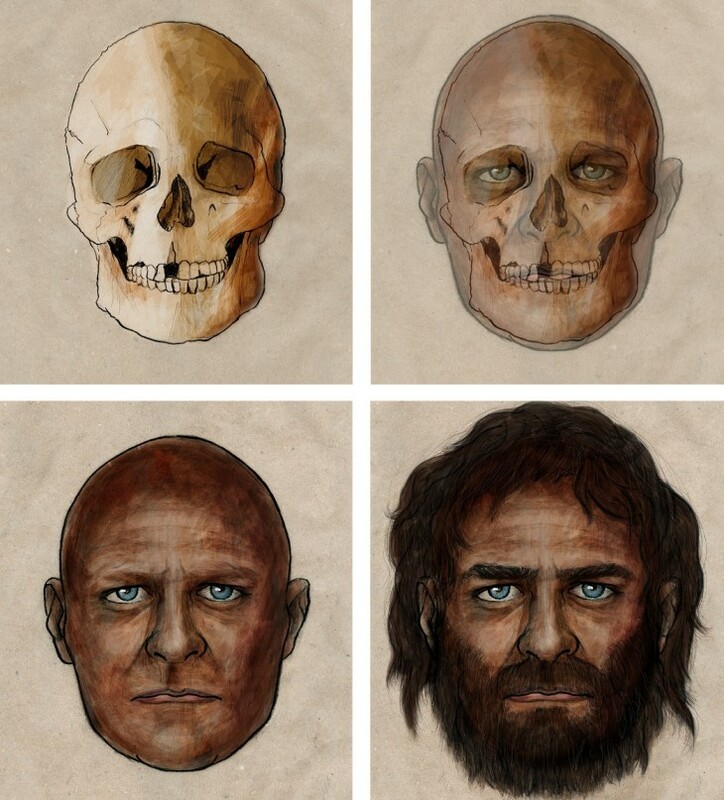 A progression of sketches shows how a skull and genetic clues were combined to come up with the look of a 7,000-year-old hunter-gatherer who lived in Spain. A 7,000-year-old man whose bones were left behind in a Spanish cave had the dark skin of an African, but the blue eyes of a Scandinavian. He was a hunter-gatherer who ate a low-starch diet and couldn't digest milk well — which meshes with the lifestyle that predated the rise of agriculture. But his immune system was already starting to adapt to a new lifestyle. Researchers found all this out not from medical records, or from a study of the man's actual skin or eyes, but from an analysis of the DNA extracted from his tooth. The study, published online Sunday by the journal Nature, lays out what's said to be the first recovered genome of a European hunter-gatherer from a transitional time known as the Mesolithic Period, which lasted from 10,000 to 5,000 years ago. It's a time when the hunter-gatherer lifestyle was starting to give way to a more settled existence, with farms, livestock and urban settlements. The biggest surprise was that the genes linked to skin pigmentation reflected African rather than modern European variations. That indicates that the man had dark skin, "although we cannot know the exact shade," Carles Lalueza-Fox, a member of the research team from the Spanish National Research Council, said in a news release. At the same time, the man possessed the genetic variations that produce blue eyes in current Europeans. That combination makes for a rare genetic profile, but perhaps it was more typical of the Mesolithic Period. To find out, the researchers say they'll need to analyze more genomes from that time — starting with La Braña 2, another male whose skeleton was found in the Spanish cave. 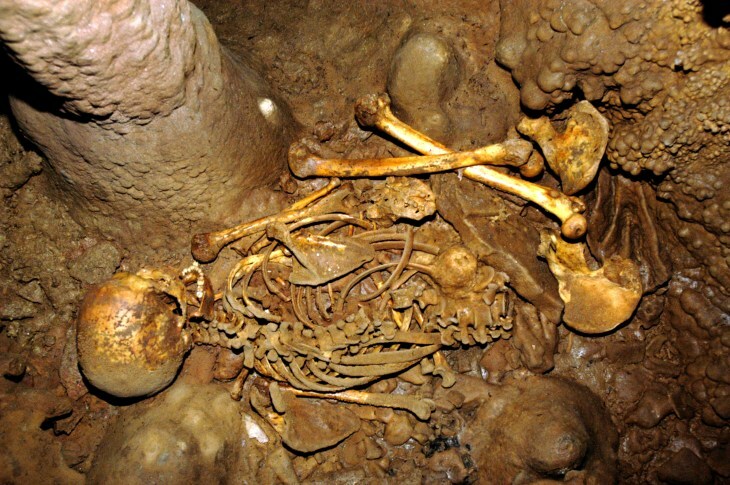 The skeleton of the male known as La Braña 1 lies in a Spanish cave, as seen after its discovery in 2006. Why were Sylvas ancestors named so? PS. I dont have blue eyes, both of my brothers do. What is the reason why my blue eyed brother would always darken the TV screen? Why do the northerners who live in dim light are blue eyed, but those in the sunlit south have dark eyes ? Edited by Arpa, 29 January 2014 - 11:02 AM. Leo Frobenius is being proven correct, time and again.